Between 1951 and 1992, there were a total of 928 announced nuclear tests at Nevada Test Site. Of those, 828 were underground. (Sixty-two of the underground tests included multiple, simultaneous nuclear detonations, adding 93 detonations and bringing the total number of NTS nuclear detonations to 1,021, of which 921 were underground.) The site is covered with subsidence craters from the testing. The Nevada Test Site was the primary testing location of American nuclear devices; 126 tests were conducted elsewhere (many at the Pacific Proving Grounds in the Marshall Islands). During the 1950s, the mushroom cloud from these tests could be seen for almost 100 mi (160 km) in either direction, including the city of Las Vegas, where the tests became tourist attractions. Americans headed for Las Vegas to witness the distant mushroom clouds that could be seen from the downtown hotels. On July 17, 1962, the test shot "Little Feller I" of Operation Sunbeam became the last atmospheric test detonation at the Nevada Test Site. Underground testing of weapons continued until September 23, 1992, and although the United States did not ratify the Comprehensive Test Ban Treaty, the articles of the treaty are nevertheless honored and further tests have not occurred. Subcritical testing, tests not involving the full creation of a critical mass, continue. 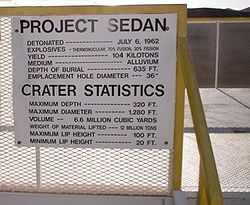 One notable test shot was the "Sedan" shot of Operation Storax on July 6, 1962, a 104 kiloton shot for the Operation Plowshare which sought to prove that nuclear weapons could be used for peaceful means in creating bays or canals—it created a crater 1,280 feet (390 m) wide and 320 feet (100 m) deep that can still be seen today. While most of the larger tests were conducted elsewhere, NTS was home to tests in the 500 kiloton to 1 megaton (2 to 4 petajoule) range, which caused noticeable seismic effects in Las Vegas. The site was scheduled to be used to conduct the testing of a 1,100-ton conventional explosive in an operation known as Divine Strake in June 2006. The bomb is a possible alternative to nuclear bunker busters. However, after objection from Nevada and Utah members of Congress, the operation was postponed until 2007. On February 22, 2007 the Defense Threat Reduction Agency (DTRA) officially canceled the experiment. NTS also performed "piggyback" testing of effects of nuclear detonation during the above-ground tests. Vehicles, shelters, utility stations, and other structures were placed at various distances from the "Ground Zero" detonation point of each weapon. Homes and commercial buildings were built to standards typical of American and European cities. Other structures included military fortifications (of types used by both NATO and the Warsaw Pact), civil defense, and "backyard" shelters. In a typical test several buildings might be built using the same plan with different types of paint, landscaping, cleanliness of yards, wall angles, or distances from Ground Zero. Mannequins were placed in and around vehicles and buildings. High-speed cameras were placed in protected locations to capture effects of radiation and shock waves. Typical imagery from these cameras shows paint boiling off of the buildings, which then are pushed away from Ground Zero by the shock wave before being drawn toward the detonation by the suction caused by the climbing mushroom cloud. This testing allowed the development of guidelines, distributed to the public, to increase the likelihood of survival in case of air- or spaceborne nuclear attack. Each of the underground explosions—some as deep as 5,000 feet—vaporized a large chamber, leaving a cavity filled with radioactive rubble. About a third of the tests were conducted directly in aquifers, and others were hundreds or thousands of feet above the water table. 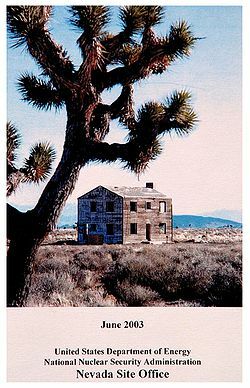 When testing ended in 1992, the Energy Department estimated that more than 300 million curies of radiation remained, making the site one of the most radioactively contaminated places in the United States. In the worst affected zones, radioactivity in the tainted water reaches millions of picocuries per liter. (The federal standard for drinking water is 20 picocuries per liter.) Although radiation levels in the water have declined over time, the longer-lived isotopes will continue to pose risks for tens of thousands of years. The Energy Department has 48 monitoring wells at the site and recently began drilling nine deep wells. Because the contaminated water poses no immediate health threat, the Department has ranked Nevada as a low priority for cleaning up major nuclear weapons sites, and it operates far fewer wells than at most other contaminated sites.